Andrew Kapitonovich Krasin (21.05.1911 – 28.03.1981) is a great nuclear power energy scientist. He was an academician of National Academy of Sciences of Belarus (1960), doctor of physical and mathematical sciences (1955), professor (1957). 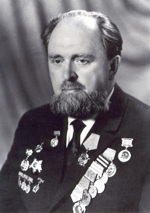 He was awarded by the name of Honored Science and Techniques Worker of BSSR (1968).He participated in Great Patriotic War. He graduated Tomsk University in 1934. In period 1934-1940 he worked in Siberian physical and technical Institution and in Tomsk University as senior lecturer. In 1945 A.K. Krasin worked in I.V. Kurchatov laboratory. From 1946 he worked in Obninsk Physical-Energetic Institution – as a scientific vise-director, then in 1956-1959 as director and in 1959-1961 as a researcher. In 1961 he becomes a leader of atomic energy department in the Institute of Energy of AS BSSR. In 1965-1977 he was a director of Nuclear Energy Institution of AS BSSR. Simultaneously, he was Academician-Secretary of Physical-Engineering Science Department of AS BSSR. From 1977 he was a head of hydrogen energetics laboratory of Heat and Mass Transfer Institution of AS BSSR. He was ordered by Lenin premium in 1957 for the development of the first in the world nuclear power plant. He is an author of more than 350 scientific works and special developments, 3 books and several inventions. A. K. Krasin was ordered by Lenin order (1958), October revolution order (1971), order of Patriotic War II-degree (1945) and several medals. Main publications: Energetic nuclear reactors, M. 1957; Atomic electrical power stations, M. 1959; Reactors of nuclear power plants, Minsk, 1971.